An obscure mid-sixties beat group from Hatfield in Hertfordshire. All teenagers, they featured a fifteen year old Mick Taylor, who went on to fame and fortune with John Mayall and The Rolling Stones. Alan Shacklock, who was just fourteen at the time, was later with Chris Farlowe's backing group and Babe Ruth, whilst Brian and John Glasscock were later with The Gods and Toe Fat amongst others. 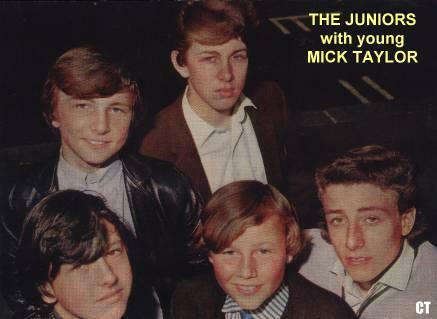 The Juniors released a 7" single in 1964: There's A Pretty Girl/Pocket Size. This item exist as promo and stock copy in UK, but only as promo in USA. These tracks were also released on a Frencg compilation CD in 2000, Made In England - Vol. 2.